There is nothing like watching a band live to really get the a sense of who they are and how much they enjoy what they do. Sometimes watching a band’s rapport and listening to their stories can be just as entertaining as the music itself. Last night was no exception. The Irish band Téada, visited the Barre Opera House on Saturday night and wowed the crowd with lively music, touching songs and funny limericks. Yes, that’s right Limericks, don’t worry they were clean. Téada in Irish means “strings.” I did kind of wonder why only two of the band members actually play stringed instrument in a band named “strings.” But I guess when you’re a rocking’ Irish band it doesn’t much matter what your name is. 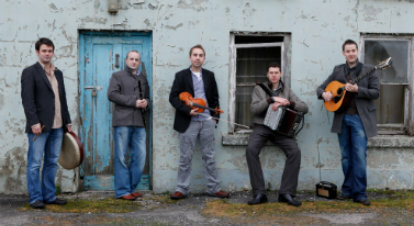 The band was made up of Oisín MacDiarmada on fiddle, Seán McElwain on guitar, Tristan Rosentock on bóhdran, Jack Talty on concertina and piano, and Sean Gavin on flute. The band was joined by Séamus Begley on accordion and vocals. Séamus Begley is considered one of the finest accordion players of the dance music of West Kerry and is quite the story teller and singer with his sharp wit and soft voice. All of them were clearly masters of their instruments. The music and their energy was lively and fun. The band formed in 2001 and has toured all over the US, Canada, Europe, Israel and Australia. And though they just came from Hartford, CT the night before, us Vermonters gave them a warm welcome with lots of woot’s, clapping and a standing ovation. That they should come back earlier rather than later!